Tired of predictable things to do in Washington DC? We are too! That's why we've got 14 lesser known, fun, cool, weird, different attractions that our nation's capital has to offer. First and foremost, Events DC is an excellent resource. Click the image below to see Events DC's list of upcoming events! And definitely check out Free in DC. Follow @FreeInDCBlog on Twitter too! Check out The Kennedy Center's YouTube page for a list of all the upcoming Millennium Stage performances and livestreams! About: On Sunday afternoons during warm weather, people gather from 3 to 9 p.m. in the upper park to dance and participate in a Drum Circle. This activity, held in the park since the 1950s, regularly attracts both enthusiastic dancers and professional drummers. Check out this great video from the Washington Post about the Meridian Hill drum circle! "How to Get to the Cherry Blossoms" — the best ways to get down to the Tidal Basin to see the cherry blossoms. About: The National Bonsai & Penjing Museum is home to one of the largest collections of bonsai and penjing in North America. The Arboretum grounds are open every day of the year except December 25 from 8:00 a.m. to 5:00 p.m. Admission is free. Hours: The National Bonsai & Penjing Museum is open from 10:00 a.m. to 4:00 p.m.daily except for federal holidays November through February, so plan to visit this collection first if you visit late in the day. About: Dacha is about as basic as it gets: picnic tables, lots of standing room and a dozen beers on draft, primarily German and Belgian but with a few Americans tossed in. Beers flow from taps on the side of a truck, but the selection is very good, including five different brews from Bavaria’s Weihenstephan, including Oktoberfest and the very refreshing pilsner. Beers come in the classic half-liter glasses or, if you’re really thirsty, a one-liter boot: Just remember to watch out for the air bubbles that come out of the toe when you drink down to the bottom. Half-liters are $7, boots are $14. 7. Active? Got some time? Hike Rock Creek! Rock Creek Park is a large urban park that bisects the Northwest quadrant of Washington, D.C. Fun fact: The park was created by an Act of Congress in 1890. Hours: Open 6am - 7pm every day (except national holidays). Here's Rock Creek on a map! And here's a street-level view of Rock Creek Park! 8. Fancy an awesome brunch? Head to Kangaroo Boxing Club! "OVERALL: Cute place for brunch or good BBQ. This is a meat-centered establishment, though there are some veg options. For gluten intolerant friends: there's also an entirely separate GF menu, and any burger or sandwich can be served without a bun, which is pretty handy. ATMOSPHERE: In terms of ambience, which nobody ever seems to mention on Yelp, it's sort of divey, sort of back-woodsy; overall, unremarkable. It's pretty plain inside and rather dark. The inside is very cramped, and I don't recommend getting a table there for breakfast or lunch. For chill evenings or a late-night snack, the bar is comfortable, and you can order food right there." Check out their brunch menu right here (you may need to click/tap the image to get better resolution!). 9. Catch a show at the U Street Music Hall. About the U Street Music Foundation: As D.C.’s music scene continues to expand, it’s incredibly important for us to ensure that we’re building something for future generations and not just ourselves. The U Street Music Foundation is a nonprofit organization supporting music education programs and events for Ward 1 and Washington D.C. area youth. Through grants to nonprofits and education programs, hands-on events and strategic partnerships, the U Street Music Foundation seeks to forge stronger bonds between the rich musical culture in Washington D.C. and the communities in which it exists. Check out the latest news + upcoming shows from U Street Music Hall on their Twitter feed! 10. Eat well at The Well Dressed Burrito! This is about as "hole in the wall" as it gets — it's literally tucked "somewhere in an alley" — but it's burritos are absolutely Earth shattering! And its hours are very specific. 11. Tired of boring museums? Check out the Newseum! The Newseum, headquartered in Washington, D.C., is dedicated to free expression and the five freedoms of the First Amendment: religion, speech, press, assembly and petition. Hours: 9AM - 5PM every day! 12. Check out Flash nightclub. The Club Level features an acoustically treated studio-quality room showcasing a custom Funktion One sound system and a next-generation lighting rig designed to heighten the experience. It provides a balance between dance floor, fully stocked bar and wall-to-wall bench seating. 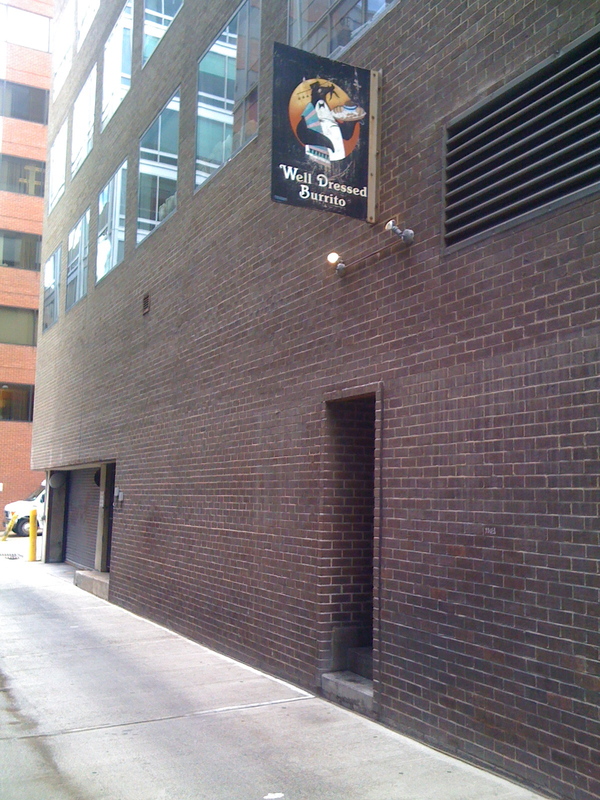 The ground floor, appropriately named Flash Bar, features a separate dance floor and DJ area, coat check, ATM, additional restrooms, and a fully stocked bar specializing in a wide selection of liquor and hand-crafted cocktails. "I don't even know how to explain how dope this place is..."
Blind Whino is a 501(c)(3) Non-profit Arts Club and Event Space located in the Southwest Corridor of Washington DC and birthed from creators Shane Pomajambo of Art Whino and Ian Callender of Suite Nation. The organization was founded on the principal that art is a catalyst for change in a community, providing inspiration and motivation for those that encounter its power. Our Mission is to provide a functional, art space for all to enjoy and learn more about the arts culture through various exhibits, events, live performances and artist workshops. The building embraces all things creative with all of its being. As an art object itself, with the exterior fully painted, it serves as a pillar for creativity in our Nation’s Capital. Check out this video that gives a glimpse of what Blind Whino is all about. HEADS UP! The Freer is closed for renovation and reopening in 2017. The Sackler remains open, with a full lineup of exhibitions and events both in the museum and around DC. About The Peacock Room: James McNeill Whistler's masterpiece of interior decorative mural art. He painted the panelled room in a rich and unified palette of brilliant blue-greens with over-glazing and metallic gold leaf. Painted between 1876–77, it now is considered one of the greatest surviving aesthetic interiors, and best examples of the Anglo-Japanese style. I first noticed this attraction on Lonely Planet's list of 20 unusual things to do in Washington DC, so a big thanks to them for the inspiration! And check out this video about The Peacock Room!